Iris hookeri (syn. 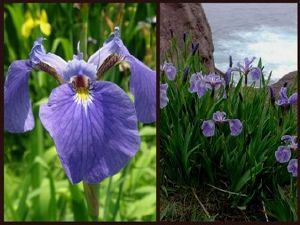 Iris setosa var.canadensis ‘Nana’) – is the true dwarf perennial Iris. Porcelain blue flowers bloom in spring among the grey-green swords held vertically. This dwarf hardy perennial Iris is a very nice upright element in the rock garden and will be further dwarfed if grown in a trough where it is just shines. This sweet little iris has been kicked back and forth by taxonomists. Said to prefer acid conditions in full to part sun, but we have grown it in calcareous soils and it has thrived. This perennial Iris is clump forming, a slow to moderate grower and totally hardy,the grey-green foliage is especially handsome. Height up to 30cm, Spread up to45cm. Ideal for rock gardens, troughs and planters, patio pots, or at the front of the perennial border.